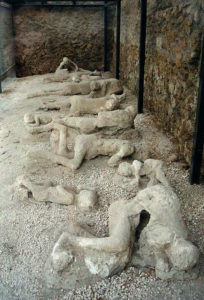 History tells us that the city of Pompeii was destroyed when Mount Vesuvius erupted on August 22, 79 AD – or was it two months later? before the first of November,” or October 17. There is no year given, but as the charcoal writing probably wouldn’t have lasted long before fading away, the writing is most certainly from the year 79. The house containing the inscription was apparently in the middle of being redecorated when it was buried underneath the ash, indicating that its owners were never able to plaster over the writing. This evidence builds on some historians’ arguments that the volcano erupted in the autumn because autumn fruits and wine – made from grapes harvested in early fall – were found among the wreckage, as were townspeople wearing cold-weather clothing. Researchers have also floated the idea of a later eruption date based on weather patterns. They deduced that the winds that the winds that blew the cloud of ash over the city likely came from the east, but winds in Naples don’t normally come from that direction in summer. A 17-year-old Pliny the Younger was the sole eyewitness to the eruption, but did not write his detailed account of it until about 25 years later. The historian’s original report was lost, leaving behind copies made during the Middle Ages that state varying dates of the eruption, from August to November.